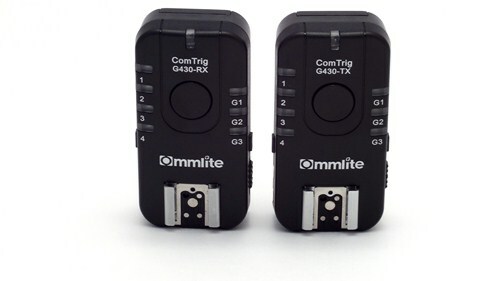 The ComTrig G430 2.4GHz flash trigger from Commlite was announced at the same time as the ComTrig H550 transceiver with “ultra speed” synchronisation, with which it is compatible. You can buy the G430 as a cheaper, more basic alternative to the H550, or use G430-RX receivers to supplement an existing H550 transceiver set-up. Note that the ComTrig G430 is also known as the Ojecoco H-430. Confused? Read this explanation. It is readily apparent that the ComTrigs look quite similar to competitor brands such as the Phottix Strato and Pixel Rook. The problem with the latter brands is that they don’t have many capabilities beyond normal triggering. Yes, the Phottix Odin can set off a Strato receiver in a similar way, but the Odin is much more expensive with added features you may not want (such as wireless TTL) and lacking some you might need (like TTL pass-through). Combine the G430 with Commlite’s H550 and you can have affordable, adjustable synchronisation all the way up to 1/8000 second. 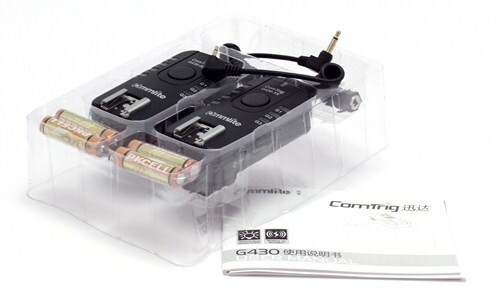 The ComTrig G430 kit comes with one transmitter, one receiver, instructions, a warranty card and a sync cable. There are sets for Nikon and for Canon (though sadly no dedicated models for Sony or other brands) and here we tried out the final production version of the G430 for Nikon. You can use the G430 as a wired or wireless remote for a camera, though no shutter release cable is included so you’ll have to buy it separately. The test buttons on both transmitter and receiver are used to check your flash connection and for remote shutter release functions. For some reason, wireless flash grouping doesn’t work with the receiver in “camera” mode, so if you have lots of slave cameras then you’ll need to fire them all at once or put them on different channels instead. The devices feel strong and look slick. Both transmitter and receiver have large, easy-to-grip thumb wheels to lock the units securely into hotshoes or coldshoes. The receiver has a metal 1/4″ tripod socket to mount it on a tripod or light stand. The only mounting option these triggers don’t seem to have is a lanyard hole, but it’s not impossible to wrap a piece of string round the foot. Groups and channels are clearly indicated by little green LEDs. Though the channel indicators are only labelled 1 through 4, there are actually 5 channels: “1”, “2”, “3”, “4” and “1234”. By default the LEDs are unlit. Tap the “CH” button once to remind you of the current channel, then tap again to change the setting. The “Group” button works in the same way. The receiver can be set to one of the three groups, G1, G2 or G3 while the transmitter can be configured to trigger any of seven combinations of them. The mode switch should be easy to read and unambiguous even for someone who doesn’t speak English. The only thing I think could be improved is to move the “Off” position to the end rather than the middle, so that it’s easier to switch off the devices without inspecting the label (for instance, when packing up in the dark at the end of an evening photo shoot). The ports on the G430s are 2.5mm audio jacks, not the archaic and notoriously unreliable Prontor/Compur (PC) ports that other manufacturers keep using for some reason. The cord included in the box – a 2.5mm to 3.5mm with a 3.5mm/6.35mm adapter, lets you connect the “Flash” socket on the receiver to a slave speedlight or studio flash. The “Camera” port on the receiver is to connect a remote camera to be wirelessly set off by the transmitter. You can also connect a camera directly to the transmitter’s own “Camera” port and then use it as a shutter release cable. 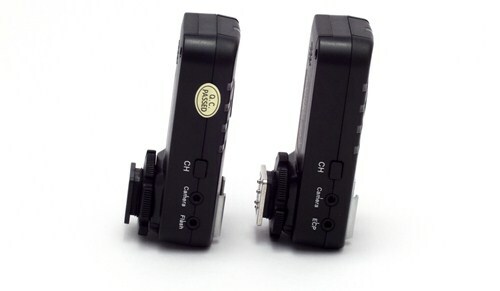 An “ECP” port on the transmitter lets you control the G430 when the transmitter isn’t necessarily on your camera hotshoe. For instance, you can connect a light or sound detector for use in high speed photography. One port that the G430 does not have is an external power input. You are entirely reliant on batteries. In a test of 200 shots, the ComTrig G430 had zero dark frames, even in the presence of several WiFi routers that might otherwise be expected to interfere with the 2.4GHz wireless signal. Unlike the over-hyped Cactus V5 – which doesn’t work at short ranges, making it almost useless for macro photography – the ComTrigs experienced no syncing issues wherever I put them. The G430 will trip flashes at shutter speeds up to 1/250 second without banding on the Nikon D700. Combined with the H550 it can reach 1/8000 second. 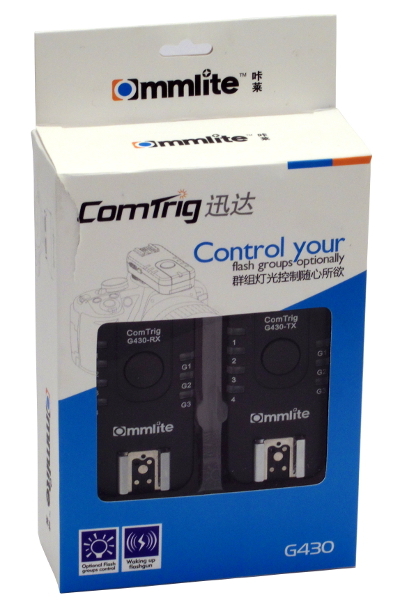 I would recommend the Commlite ComTrig G430 as a flash or camera remote for general use. It’s superior to the Yongnuo RF-602 of yesteryear and has no reason not to become the most popular budget wireless trigger. Unlike the Pixel Rook, it’s compatible with the H550 and future ComTrigs. Of course, it all depends on price and availability. 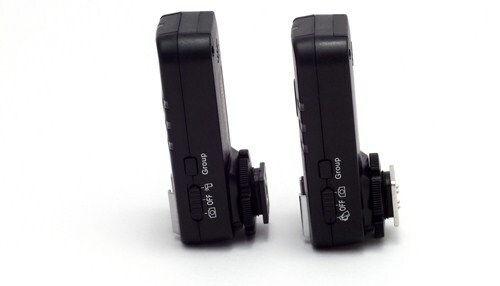 You can buy the same trigger, the Ojecoco H-430, from CotswoldPhoto on eBay. The G430-TX transmitter is £21 and the G430-RX receivers cost £24 each, plus postage. Click here for listings. 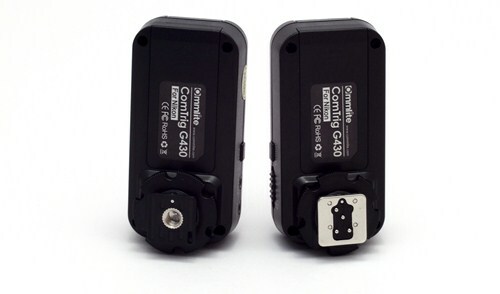 Update: The ComTrig G430 kit (one transmitter and one receiver) is now available from ThePhotoGadget for US$54.99. The manufacturer provides a 12 month warranty. You can find more technical information on Commlite’s product page.